Thank you for your access. 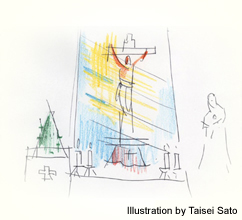 The Zushi Catholic Church homepage. The Church being neither a retail store not a venue for daily events, use of the internet did not seem particularly necessary. However, it occurred to me that more and more I was using my personal computer for ordering goods, checking information about events and their locations. By the same token, might it not be useful to have a homepage announcing “Here is a Church”. A church is a place where the faithful gather. Yet even if there is only one single person who is genuinely alive to God, that person will channel God’s grace, bringing the same awareness to the people around him. Thus around that person, a “church” will form. In that sense, the idea of the church as a collection of people with the same faith becomes absurd. Rather, I would define the church as a place where local people can feel free to come and go. Zushi Catholic Church, together with other local churches, as part of the contribution to recovery from the Great East Japan Disaster, began selling “disreputable” vegetables from Fukushima. This began from a feeling of wanting to give support, but has now transformed into one of eager anticipation for the delicious fresh organically farmed produce that arrives on the first Sunday of the month, available from seven in the morning until noon. Lately, local residents are becoming regular customers. It makes me happy that our Church is playing its part as a place linking the people of Fukushima with the people of the neighbourhood. It was also one of the venues for Zushi Art Festival, with a concert of folklore, gospel choir and church-music performances, and has become the base for regular third-Saturday-of-the-month rehearsals for “Zushi Dolphin Children’s Choir”, where children from different school districts can meet each other. To facilitate information exchange, Facebook is also being considered. It goes without saying that the internet is used simply as a means to say “This is where we are”, the ultimate goal being face-to-face encounters and informally building up warm human relationships.